If you like cupcakes, like baking cupcakes, or even like eating cupcakes then the Cupcake Camp OC is for you! The Cupcake Camp OC is coming up on August 1st from 3 to 6 pm. It will be held at the Atrium Hotel in Irvine across from the John Wayne Airport. 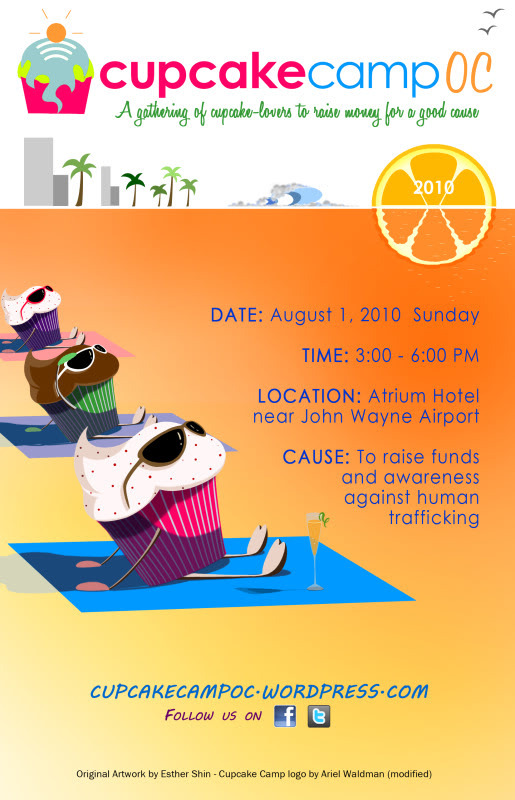 The event is to celebrate the glorious cupcake and to bring awareness to their cause, human trafficking. Visit their Cause page. In addition the event will showcase many of the incredible c-cake bakers in the OC. There will be a lot going on, baking competitions, a cupcake eating contest, raffles, fundraiser and more. If this is not fun I am not sure what would be and it all supports a good cause. In addition they have an impressive list of donors and friends that I am sure will be bringing their best creations. I know I am looking forward to some c-cake love! If you are interested in being in the competition then you are in luck. They just extended the deadline for entries. Do you have what it takes to win? If so click here to enter!